Abby the Librarian: AudioSynced November Roundup! 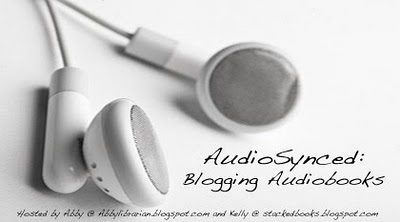 Yes, it's time for AudioSynced, a monthly roundup of audiobook reviews from all around the blogosphere! I was not very on the ball about reminding people this month, so if you've posted a review of an audiobook in November and I missed it, please leave me a comment and I'll add it to the roundup!! Didn't review an audiobook this month? That's okay! AudioSynced will be back next month at STACKED! Right here at Abby the Librarian, I reviewed Alanna: The First Adventure by Tamora Pierce, read by Trini Alvarado (Listening Library, 2003). If you haven't read the Alanna books, I highly recommend the audio recordings! Kim at STACKED reviewed First Light by Rebecca Stead, read by David Akroyd and Colleen Marlo (Listening Library, 2010). Scumble by Ingrid Law, read by David Kremenitzer (Penguin Audio, 2010). Forge by Laurie Halse Anderson, read by Tim Cain (Brilliance Audio, 2010). The Collected Stories of Winnie the Pooh by A.A. Milne, read (dramatized) by a bunch of people (Hodder Children's Audio, 1997; reissued by Listening Library, 2009). 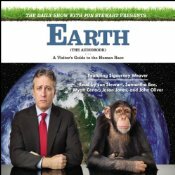 Swapna at S. Krishna's Books reviewed Earth by Jon Stewart and the Daily Show (Hachette Audio, 2010). Jen at Devourer of Books reviewed The Dead Beat: Lost Souls, Lucky Stiffs, and the Perverse Pleasure of Obituaries written and read by Marilyn Johnson (HarperAudio, 2010). Perfect Chemistry by Simone Elkeles, read by Roxanne Hernandez & Blas Kisic (Brilliance Audio, 2009). Twisted by Laurie Halse Anderson, read by Mike Chamberlain (Listening Library, 2007). Dark Life by Kat Falls, read by Keith Nobbs (Scholastic Audio, 2010). City of Bones by Cassandra Clare, read by Ari Graynor (Simon & Schuster Audio, 2007). To Kill a Mockingbird by Harper Lee, read by Sissy Spacek (Recorded Books, 2006). 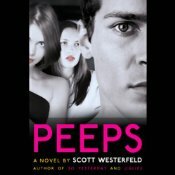 Peeps by Scott Westerfeld, read by Joshua Swanson (Penguin Audiobooks, 2008). The Brethren by John Grisham, read by Frank Muller (Random House Audiobooks, 2000). Bryce at Only the Best Science Fiction & Fantasy reviewed Ender's Shadow by Orson Scott Card, narrated by a full cast (Macmillan Audio, 2005) and Mockingjay by Suzanne Collins, read by Carolyn McCormick (Scholastic Audio, 2010). Sophie at Mundie Moms reviewed Clockwork Angel by Cassandra Clare, read by Jennifer Ehle (Simon & Schuster Audio, 2010). Patti at Peppermint PhD reviewed The Kite Runner written and read by Khaled Hosseini (Simon & Schuster Audio, 2003). Travis at 100 Scope Notes reviewed Toby and the Secrets of the Tree by Timothee de Fombelle (Brilliance Audio, 2010). proseandkahn's got a review of Before I Fall by Lauren Oliver (Harper Audio, 2010). What audiobook reviews from November am I missing? Leave me a link in the comments and I'll add 'em. And hey, if you like our monthly AudioSynced roundups, help us spread the word! We collect and post links to audiobook reviews around the blogosphere on the first of every month. Links and Tweets are appreciated!